Iran has restricted access to Google’s email service, Gmail, and search engine. The latest move coincides with protests throughout the Muslim world – including some in Tehran – against an anti-Islamic film posted on Google’s video-sharing site YouTube. A government deputy minister announced the ban on Sunday on state television. “Google and Gmail will be filtered nationwide, and will remain filtered until further notice,” said an adviser to Iran’s public prosecutor’s office Abdul Samad Khoramabadi. The BBC Persian service says: “Google search website is accessible, but is not functioning properly. 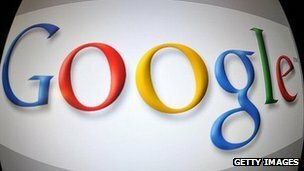 Google services which need a secure SSL [Secure Sockets Layer] connection are out of reach in Iran. Many Iranians already use VPNs to bypass the government’s restrictions on other blocked Western websites, said Mahmood Tajali Mehr, an Iranian telecommunications consultant living in Germany. 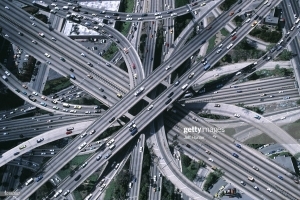 “This is just a move by the Iranian governement towards a so-called nationwide intranet, to control all the traffic from the outside, and authorities are saying they will implement it in about three years. 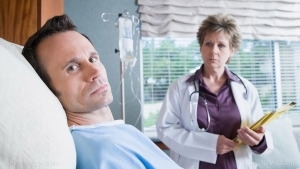 Mr Mehr said that he did not think the services were going to stay restricted for long. “This is just a propaganda tool to demonstrate that Iran is doing something against the US, but it is unlikely to last longer than a few days. 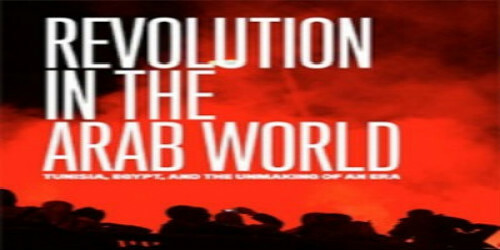 “The current trouble with the anti-Islamic film is helping the government with this propaganda. “The state is saying that the people are asking to block these services because of the film, but there haven’t been such protests as in Pakistan and elsewhere, only small organised protests, so my personal feeling is that it has nothing to do with the film. Google’s YouTube site has been censored since mid-2009, following protests and allegations of vote fraud after the re-election of President Mahmoud Ahmadinejad. Despite the government claiming that the people had requested the censorship, many told the BBC they were outraged by the ban. The BBC’s Persian Service said that the country’s Twitter users were protesting, and “even mocking” the decision, with some expressing concern about this being “a preliminary step towards setting up a national intranet”. “This is a pre-determined scenario to block Google in Iran, they wanted to do this since long time ago,” tweeted one user, Hadi Khezriyan. “Google has removed the name of Persian Gulf from its map and has banned users inside Iran to access many of its services because of sanctions,” Faramarz from Qazvin wrote in a comment to the same story. U.S. security officials have discussed with their Israeli counterparts the possibility that Israel could strike Syria‘s weapons facilities, the New York Times reported on Thursday, citing administration officials…. Final results for many constituencies in Iran‘s parliamentary runoff elections show conservative rivals of President Mahmoud Ahmadinejad winning a solid majority of seats and cementing their hold on the legislature. Of 65 seats for grabs in Friday’s election, Ahmadinejad‘s opponents won 20 while the president’s supporters captured eight seats…. A Chinese telecommunications equipment company has sold Iran’s largest telecom firm a powerful surveillance system capable of monitoring landline, mobile and internet communications, interviews and contract documents show. The former U.S. marine on death row in Iran got a reprieve on Monday when the supreme court there dismissed his death sentence and ordered a new hearing as U.S. President Barack Obama planned to meet with Israeli Prime Minister Benjamin Netanyahu. 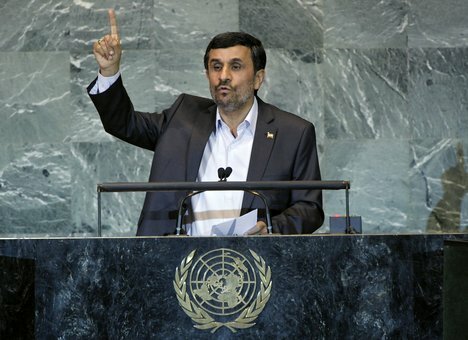 Iran’s President Mahmoud Ahmadinejad went on the warpath against the West at the UN again sparking a mass walkout by outraged US and European delegations. The Iranian leader repeated comments casting doubt on the origins of the Holocaust and the September 11, 2001 attacks and criticized the United States for killing Osama bin Laden rather than bringing him to trial. European countries use the Holocaust as an excuse to pay “ransom to the Zionists,” he said. 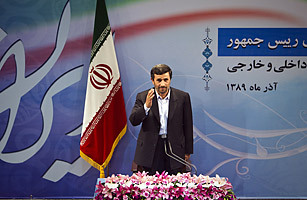 The “diabolical” aims of the West are the cause of wars and the financial crisis, Ahmadinejad stormed. In a repeat of walkouts at the United Nations and other international events in recent years, a US diplomat monitoring the speech in the UN General Assembly left halfway through the 20 minute discourse. The 27 European Union nations then followed in a coordinated protest move. “Mr Ahmadinejad had a chance to address his own people’s aspirations for freedom and dignity, but instead he again turned to abhorrent anti-Semitic slurs and despicable conspiracy theories,” said US mission spokesman Mark Kornblau. A pair of Americans convicted as spies and jailed in Iran for two years have been released and emotionally reunited with their loved ones. Shane Bauer and Josh Fattal, both 29, were flown to Oman after being freed on bail from Evin prison. 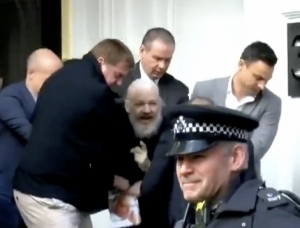 They were sentenced in September to eight years in prison on charges of spying. They were arrested in 2009 after crossing into Iran from Iraq, where they said they were hiking. “We are so happy we are free and so relieved we are free,” Mr Fattal said to reporters soon after their arrival on Wednesday in the Omani capital, Muscat. The release is as carefully choreographed as their colleague Sarah Shourd’s a year ago. Once again Iran’s president makes a magnanimous gesture shortly before appearing at the UN. The question is whether the release of the hikers is designed to defuse tensions between Washington and Tehran. The roots of the antagonism go back beyond the Islamic revolution of 1979 to the coup of 1953 which deposed Iran’s prime minister. The current distrust is focused on Iran’s nuclear programme – peaceful, and not aimed at building an atomic bomb, insists Tehran, amid Western scepticism. 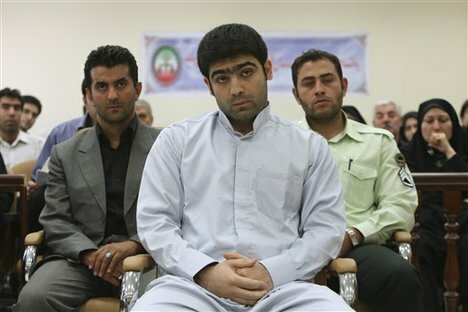 A picture released by Iran’s state-run Press TV on February 6 shows Shane Bauer and Josh Fattal at their trial in Tehran. Tehran, Iran (CNN) — Two American hikers sentenced to eight years in prison for espionage and illegal entry into Iran may be released “in a couple of days,” according to Iran’s president. 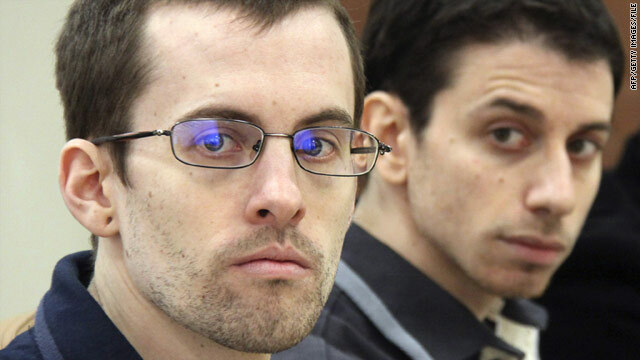 Josh Fattal and Shane Bauer will be released from Tehran’s Evin prison after a $500,000 bail is paid for each of them, their attorney, Masoud Shafiee, said Tuesday. The attorney said the hikers’ families are attempting to get the money. The two have been imprisoned in Iran for more than two years. They and a third hiker, Sarah Shourd, were seized on July 31, 2009, while hiking in the Kurdish region of northern Iraq. They apparently strayed across an unmarked border and were unaware they had crossed into Iran. Iranian authorities arrested them, claiming they were spies and had entered the country illegally. Shourd, who is now Bauer’s fiancee, was released last year for medical reasons, although authorities said her case remains open. TEHRAN, Iran — Iran’s supreme leader on Saturday told visiting Pakistani President Asif Ali Zardari that the United States is Pakistan’s real enemy. Ayatollah Ali Khamenei spoke during Zardari’s second visit to Iran in less than a month. The U.S.-Pakistan relationship has been on a downward spiral since the May 2 U.S. raid that killed al-Qaida chief Osama bin Laden in a Pakistani garrison town. Pakistani leaders have protested the unilateral raid by kicking out many American military trainers and asking the U.S. to reduce its footprint in the country. The Obama administration has withheld $800 million of the roughly $2 billion it gives Pakistan in military aid. The New York Times says the aid includes about $300 million to cover some of the costs of posting more than 100,000 Pakistani soldiers along the Afghan border as well as training assistance and military hardware. Officials have said civilian assistance will continue. The Islamic Republic News Agency said Khameini told Zardari that Pakistanis are a nation who believe in Islam and every kind of progress and success in Pakistan makes Iran pleased. Where in the world is Ahmadinejad? Iran’s president, Mahmoud Ahmadinejad, is not exactly the shy and retiring type. He loves attention. He makes outlandish claims, bold statements and outright lies – all to get the world to watch. But over the last few days, we’ve been seeing his quiet side – so quiet that he actually disappeared from sight. For ten days late last month the president of the Islamic Republic of Iran skipped cabinet meetings and canceled official visits. He wasn’t even seen in his offices. He wasn’t ill. He wasn’t on pilgrimage. Ahmadinejad was staging a boycott. Now, why would the country’s leader have to stage a boycott? Because in Iran there’s someone more powerful than the president – that’s the Supreme Leader, Ayatollah Khameini. We’re witnessing a power struggle, and it’s getting more intense. First, Ahmadinejad fired the minister of intelligence. The Supreme Leader blocked the move. Then, the president fired his foreign minister, another Khameini protege. This time the Ayatollah wrote a letter – not to President Ahmadinejad but to the deposed minister – reinstating him to his post. This open tension is unprecedented in modern Iranian politics. Never before has the president of the Islamic Republic wielded so much power and never has he clashed so openly with the clerics. Ahmadinejad has also been mounting an ideological challenge to the mullahs. He says that he, too, gets divine revelations, even though he is not a priest. He’s talked about Iran’s pre-Islamic past with great pride, which is something the clergy regards as sacrilegious. Those in the know are watching closely to see who wins this internal struggle, and here’s why it matters: These are the first major moves by Tehran’s power players to position themselves ahead of next year’s elections. There’s a school of thought, which holds that President Ahmadinejad senses that people are tired of the clergy, so he thinks he could gain mileage by distancing himself from them. Another theory holds that Ayatollah Khameini himself wants to be seen as separate from the government. Remember, inflation in Iran is at 25 percent. 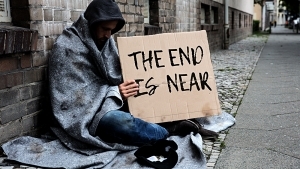 Some assessments show that unemployment is at 30 percent. So Khameini may need a scapegoat. And, of course, this all comes as leaders of Iran’s opposition movement, the Green Movement, remain under house arrest and many other opposition figures and journalists have been jailed. The Nobel Peace Laureate Shirin Ebadi is so worried for her safety that she is not returning to her country. The big picture here is that the revolutions in the Middle East have gotten all dictatorships in the region worried, including the one in Tehran. Even as its key ally, Syria, descends deeper into chaos, the Iranian government has managed to rein in disaffection with a mixture of money, bribery and repression. Iran has learned from its own protests of 2009, and so far it doesn’t seem likely that it will go the way of the Arab world yet. But I think the Iranian regime is more nervous than it reveals. Sure, it will gain some foreign policy advantages – a better relationship with Egypt, for example. But it faces the much larger problem of the dissatisfaction of its own people who have now seen democratic revolutions in the Middle East that have succeeded. Perhaps that’s why President Ahmadinejad took a break and went AWOL. While most Mahmoud Ahmadinejad headlines over the past year have focused on his defiant grandstanding on the international stage, the Iranian President is facing mounting challenges within Iran’s corridors of power: from conservatives who believe that his histrionics and mismanagement are imperiling the Islamic Republic, and from mullahs who charge that he is usurping their authority under its system of clerical rule. After successfully suppressing the street protests that followed his controversial 2009 re-election, Ahmadinejad has this year found himself at odds with just about every branch of the Iranian government, especially the parliament. In November, it came to light that the legislature had moved to impeach Ahmadinejad for attempting to increase executive authority; he’d sought to remove long-standing subsidies on basic goods amid the strain caused by economic mismanagement and international sanctions. The legislators backed off from their impeachment drive at the urging of Supreme Leader Ayatullah Ali Khamenei, but the episode revealed political divisions within the regime that will remain on the boil in the coming year. 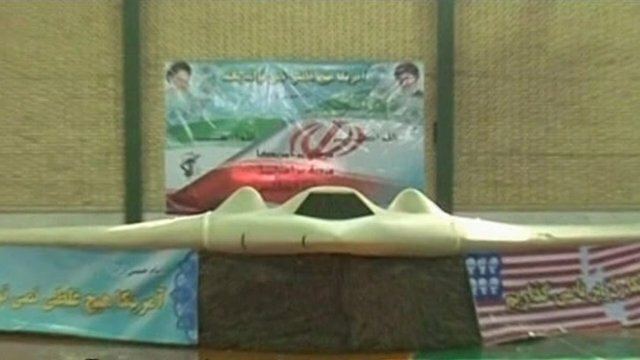 Iran’s Revolutionary Guard Corps has made a rare acknowledgement that it is involved in cyber warfare against the websites of perceived enemies. Iranian state media quote a commander of the Guards’ paramilitary Basij force as saying that the Basij has established a “cyber army” including university professors, students and clerics. General Ali Fazli says the Iranian hackers have attacked “enemy” websites in retaliation for cyber attacks on Iran. 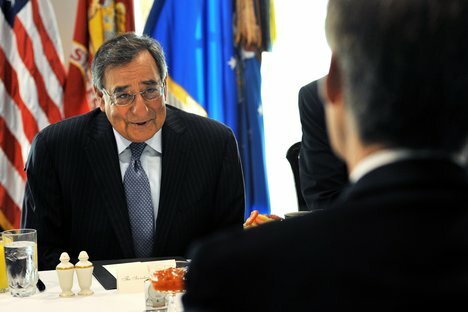 He gave no details about the types of attacks Iran has carried out. 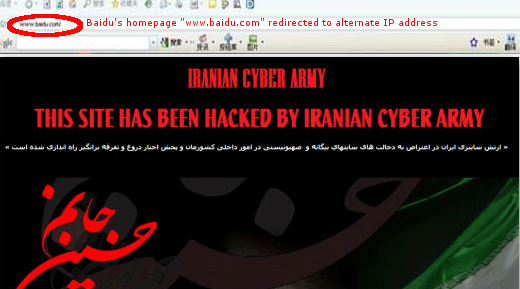 A group of hackers labeling themselves the “Iranian Cyber Army” attacked the Voice of America’s Internet site last month. The group temporarily defaced scores of VOA news pages with an anti-U.S. message below images of an Iranian flag and an AK-47 assault weapon. Iran had announced the creation of a cyber police unit in January, aimed at helping the government monitor websites used by opposition groups to organize anti-government protests. 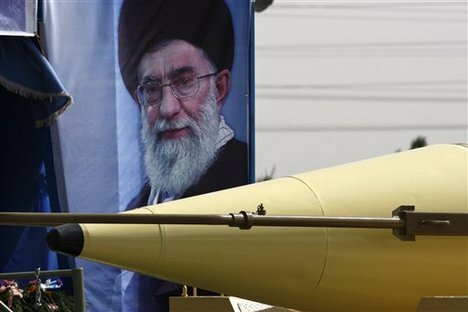 Iran also has been trying to boost its cyber defenses in response to the Stuxnet computer worm that has infected computers involved with the country’s nuclear program. 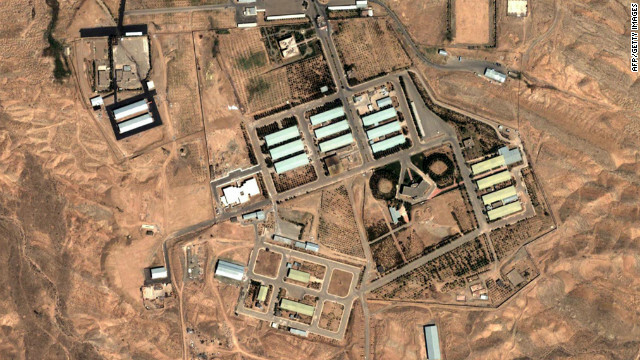 Western nations fear the nuclear program is aimed at producing weapons, a charge Tehran denies. Iranian opposition leaders Mir Hossein Mousavi and Mehdi Karroubi, and their wives, have been taken from their homes by security forces, reports suggest. Mr Karroubi’s son told the BBC he had heard his father had been moved, but did not know where he had been taken. A website close to Mr Mousavi claims the men have been taken to Heshmatiyeh jail in Tehran. 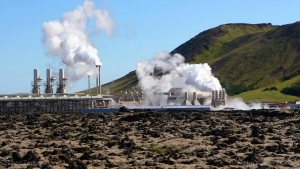 Iranian government officials denied the report, the semi-official Fars news agency said. It comes ahead of planned protests that are due to be held on Tuesday. 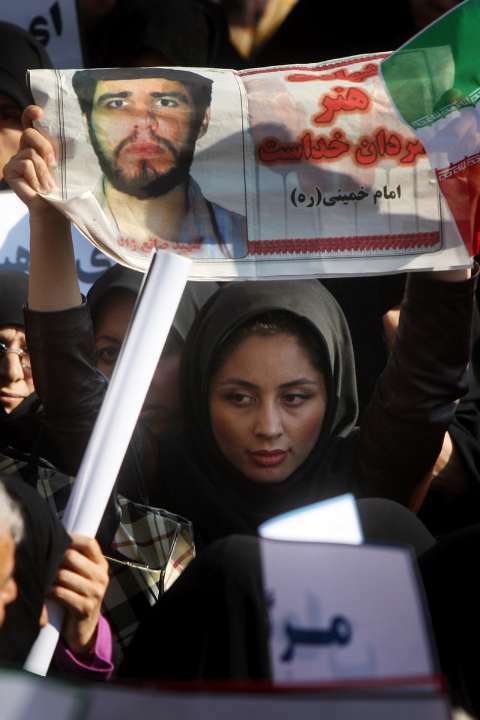 Fars quoted an unnamed official in Iran’s judiciary as denying that the men had been taken. “The two are currently in their homes and there have only been restrictions on their contacts,” the official said. 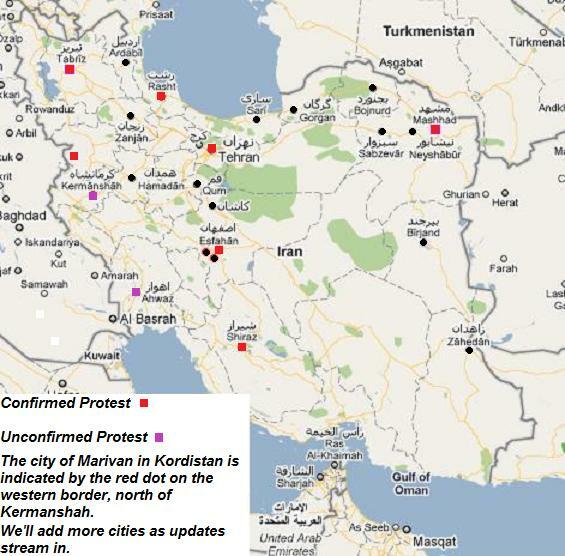 ‘Security vans’ Both Mr Mousavi and Mr Karroubi have called for demonstrations in Iran in the light of the recent uprisings in Tunisia and in Egypt. Earlier this month the two men, along with their wives, were detained in their respective homes in Tehran as protests were staged on the streets of the capital. On Monday one of Mr Karroubi’s sons told BBC Persian service he had been told his father had been “taken by security forces to an unspecified location”. 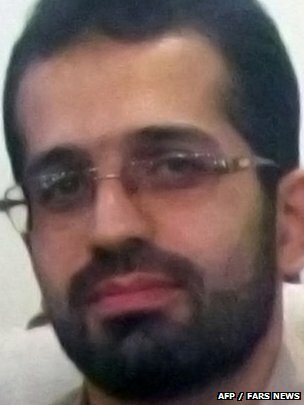 Mr Mousavi’s Kaleme website reported that the men and their wives “have been arrested and were transferred to the Heshmatiyeh prison of Tehran”. “According to credible sources, the arrest and the transfer to jail is sure but the date when it occurred is still uncertain,” it said. 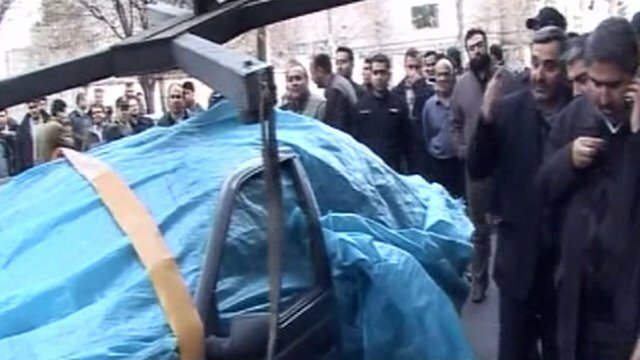 A neighbour said that he had seen eight security vans outside Mr Karroubi’s home late on Thursday night. Shortly afterwards the vans then left the area along with one car, he said. Earlier on Monday, Iran’s state prosecutor Gholam Hossein Mohseni Ejehi was quoted by the official Irna news agency saying that the country’s authorities have restricted the two men’s meetings and phone calls. 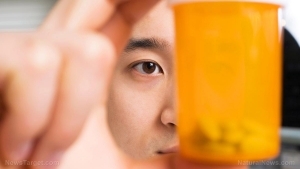 “Should circumstances arise, other measures will be taken,” he added. Thousands of supporters of Mr Mousavi and Mr Karroubi took to the streets of Tehran on 14 February, amid clashes with security forces which left two dead. Some 1,500 people were detained, opposition groups said, but official figures put the number at 150. 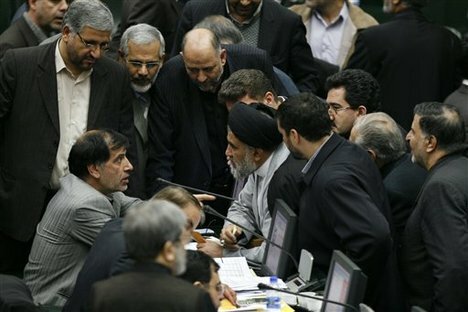 Following the clashes, Iranian MPs called for the two opposition leaders to be tried and executed. This is one warship and a supply vessel. Quite frankly, it won’t change the strategic picture a whole lot. It’s certainly one more thing to keep track of. Iran has meddled in Lebanon in the past, and I can see where it’s a concern. But I just don’t see where [Israel] coming out ahead and publicly trying to make the international community focus on this and putting pressure on Egypt to deny them passage was really effective. Iran is mostly limited by its capability. It’s very hard to do out-of-area operations. This is analogous to China sending ships to do anti-piracy operations in the Gulf of Aden or Russian warships in Venezuela. It’s a show-the-flag sort of thing. 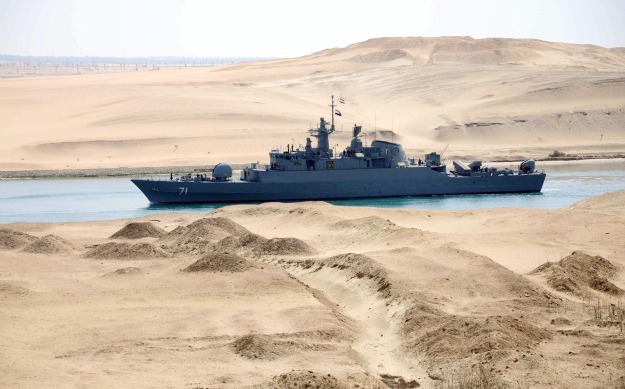 It’s not as though Iranian ships can now operate routinely or comfortably away from their home base. Iranian computer hackers on Monday hijacked the website of the Voice of America, replacing its Internet home page with a banner bearing an Iranian flag and an image of an AK-47 assault rifle. The length of Enghelab Avenue was filled with tens of thousands of protesters. Valiasr Square was the site of clashes. So was Haft-e Tir. One person is rumored to have been killed there. Other than central Tehran, heavy security presence — including special anti-riot NAJA police, Basijis, and vigilantes — were seen by this writer in western Tehran (Shahr Ara) and northern Tehran (Tajrish). I was told by several people that Tehran Pars and Imam Hossein Square in the western parts of the city were likewise inundated with various security forces. Many of the security personnel wore masks to conceal their identities, as was also true on Monday. In last year’s protests, only a handful of these men wore masks. Today, most of the Basij and Intelliegence Ministry personnel did so. Even some of the regular NAJA cops, whom many people regard as civil servants with batons, were wearing masks. Some Basijis were wearing ski masks that gave them a seriocomic look, especially when they were seen eating snacks with their masks on. BBC Persian reports that security forces are actively trying to disperse protesters and not letting them form a core. It adds that witnesses inform them that hundreds of protesters are present near Darwazaye Shiraz in Isfahan. Thousands of security officers cracked down on landmark sites in Iran’s capital and other major cities Sunday, at times striking at throngs of protesters with batons and rushing others on motorcycles, witnesses said. A few plainclothes security agents stood in the middle of Tehran’s Revolution Square, countering anti-government protesters with signs of their own in support of Supreme Leader Ayatollah Khamenei and chanting “I will give my life for the leader,” an eyewitness told CNN. Hundreds of other security personnel cheered the group. Meanwhile, another witness said large crowds chanted “Death to the dictator” at the intersection of Gharib and Enghelab (revolution) avenues. Security forces on foot and motorcycles there beat several protesters with batons and detained at least four, the witness said. Earlier, witnesses reported that security officers doubled up on motorcycles charged a group of 150 people gathered on Vali Asr Avenue, striking at least 15 fleeing protesters with batons as crowds of people grew near Revolution Square. 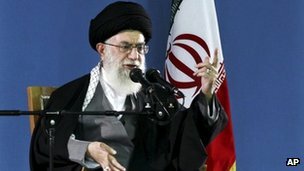 The Iranian government has called a rally in Tehran for Friday to express hatred against the opposition. It made the call as supporters of the government and of the opposition clashed at the funeral of Sanee Zhaleh, a student killed during an anti-government protest on Monday. “The noble people of Tehran will take to Enghelab Square after Friday prayers with their solid and informed presence,” the Islamic Propagation Coordination Council said Wednesday. The demonstrators will “scream out their hatred, wrath and disgust against the savage crimes and evil movements of sedition leaders, their Monafeghin and monarchist allies”, it added. Monafeghin – the farsi for hypocrites – is a reference to the outlawed armed opposition group, the Mujahedin-e-Khalq. Opposition leaders Mir Hossein Mousavi and Mehdi Karroubi called Monday’s rally in support of uprisings in Egypt and Tunisia. Two people died and several were wounded during the demonstration. 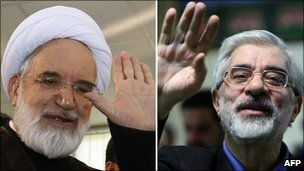 Iran’s prosecutor has warned that legal action will be taken against Mousavi and Karroubi, who were already both under house arrest on Monday. They issued defiant statements Wednesday, as government supporters called for them to be hanged. Iran’s beleaguered opposition movement, under enormous government pressure but encouraged by popular uprisings throughout the Middle East, is calling for another round of protests Sunday, raising the stakes in its confrontation with Tehran’s hard-line Islamist government. 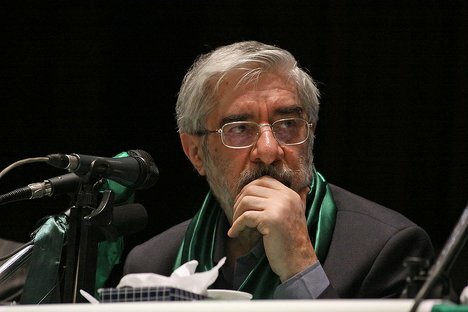 A statement posted Thursday to the website of former prime minister and 2009 presidential candidate Mir Hossein Mousavi called on Iranians to take part in memorial services to mark the religiously significant seventh day after the deaths of two Iranians during raucous Feb. 14 opposition protests in Tehran and other cities. The scope and magnitude of those demonstrations, inspired by the uprisings that overthrew Tunisian president Zine el Abidine ben Ali and Hosni Mubarak of Egypt, appeared to catch security forces and even demonstrators by surprise. They were the largest public displays against Iran’s authoritarian system since a similarly scattered and violent December 2009 day of unrest that followed the disputed reelection of President Mahmoud Ahmadinejad. Today’s protests in Iran may have had some amount of organization occur through social media, including a Facebook page called the 25th Bahman. I qualify the extent to which protest organizers may have used Facebook because Iran blocks access to the social network along with many other types of media, so people in the country have limited ability to get any message from Internet sources. Granted, some Iranians have found ways to circumvent the blockage, but that doesn’t mean everyone in the nation has figured out how to access the site. Within days of the announcement for the solidarity rally, almost 50,000 users came onto the Facebook page and the hits and the views were upwards of 12 million. When we ran the numbers, up to 90 percent of them were coming from Iran. The rally itself had about 4,000 participants show up at Tehran’s Imam Hossein Square, and the objective of the protest was to show solidarity with Egypt and Tunisia. The organizers of the rally, Mir Hussein Muosavi and Mahdi Karroubi, were denied permits for the event. 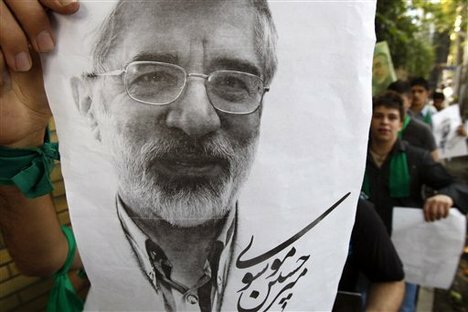 On the day of proposed demonstrations by Mousavi and Karroubi in support for the popular uprisings in Egypt and Tunisia against dictatorship, cell phones of Mir Hossein Mousavi and Zahra Rahnavard — Mousavi’s wife — as well as land lines of their residence all have been disconnected by government. All communication channels including internet networks of their residence have also been disconnected. Additionally since this morning security forces have blocked the alley where Mousavi’s residence is located at with their cars and prevent anyone from entering or exiting. After last year’s disputed elections in Iran, social networking sites like Twitter helped protesters organize and also served as a way to send news, videos and photos out to the rest of the world, showing what was really happening in the country. Iranian security forces worked to stop people from using these sites to communicate, just as other countries, such as China, have done in the past and continue to do so. Government censors are becoming more sophisticated, and this is where encryption software comes in. Privacy is a right, not a privilege, and we’ve already lost so much of it. 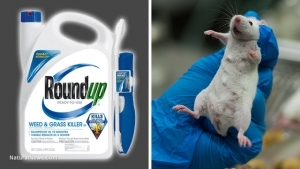 Financial privacy, for example, has nearly been vanquished from this earth, and with things like RFID passports anti-terrorism provisions, governments can track most aspects of our lives. Fortunately, though, online privacy is much easier to safeguard, and there are a variety of cheap (or even free) electronic tools to do this. Switching to a number of overseas providers can substantially mitigate this risk, and most of the offshore services are absolutely free. The service is called Cryptohippie for your consideration if you’re serious about your online privacy. You can learn more about their service here. Cryptohippie, Inc. was formed in 2007 through the acquisition of MeshMX, Diclave, and Roque Holdings – all of which were little-known but highly regarded providers of superior privacy enhancing technologies. In fact, some of the best-known privacy protection and security services licensed (and still license) earlier versions of our products. We were the first to provide VPN-based privacy protection services to the market, beginning in early 2003. Both our management and development teams are composed of seasoned professionals with long experience both in running enterprise-grade secure networks and operating businesses in the privacy market. This internet site is my inhalation, genuinely fantastic layout and Perfect written content. I think other website proprietors should take this site as an model – very clean and excellent style and design, as well as the content. You are an expert in this topic!